Hello Melbourne | THE definitive visitor guide to Melbourne. “Marvellous Melbourne” is a multicultural city, rich in cultural diversity that is reflected in our people, food, fashion, night life and the arts. Melbourne is one of the “Most Livable Cities in the world” with our great lifestyle, facilities, open spaces, cultural precincts, fantastic shopping, unique attractions, sumptuous dining, wide, tree lined boulevards, cycling lanes and unique tram transportation which alas, most cities around the world have lost. We are known as the Arts, Fashion and Culinary capital of Australia and for good reason too. Upload a PDF version of Hello Melbourne to your smart phone, tablet or laptop and take it with you where ever you go. 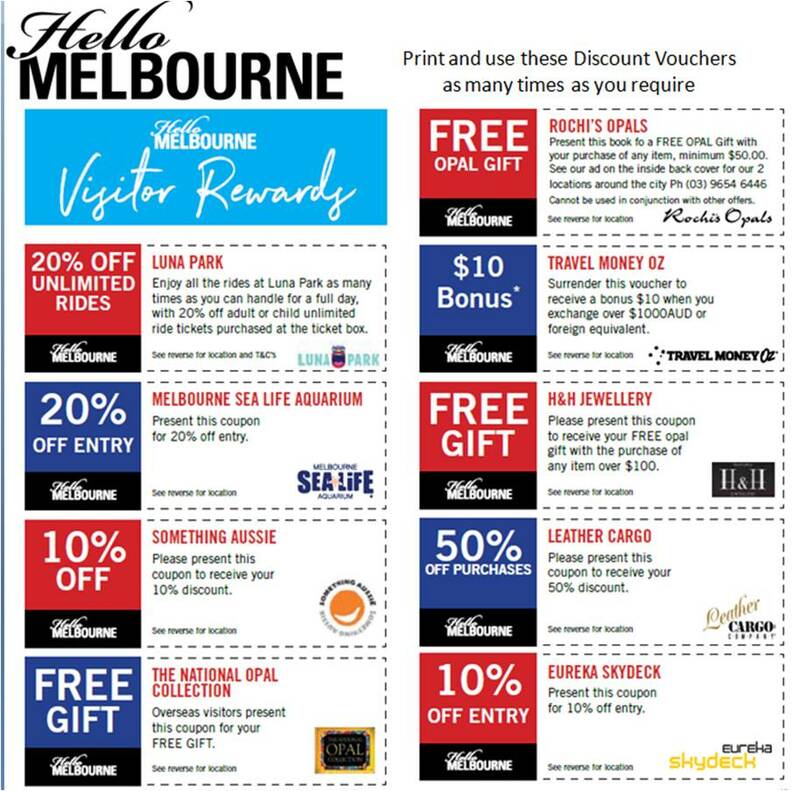 As a REWARD for using Hello Melbourne as your guide to Melbourne, we have provided you with valuable discount coupons (VISITOR REWARDS) which are worth hundreds of dollars in savings. 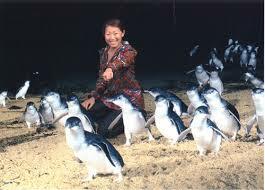 We help you SAVE money while you explore Melbourne. This our and our advertisers’ way of saying thank you for supporting us with your custom. 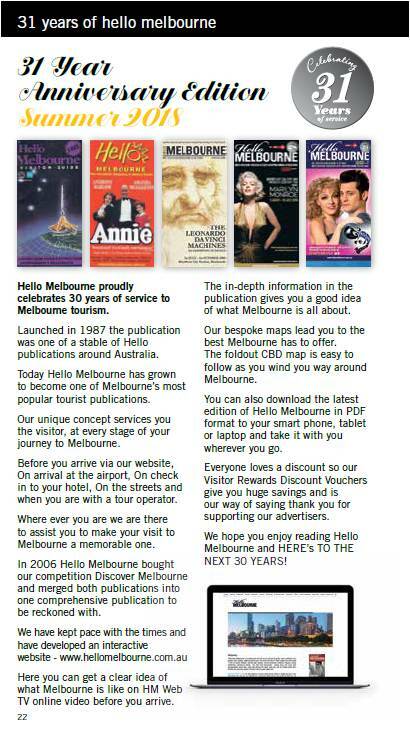 A hard copy of Hello Melbourne can be obtained FREE at Melbourne’s International and Domestic Airports at the Travelers Info Desk, at 3,4 and 5 star hotels, Tourist Information offices around the city, from select Travel Agents interstate, Car Hire Companies and select advertisers. 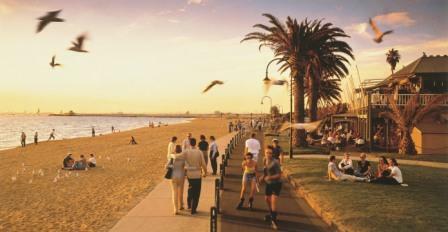 We wish you an enjoyable stay in Marvelous Melbourne!